Built to last, the 4250N is a great workgroup printer. 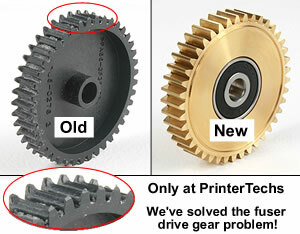 We have upgraded the swing plate assembly to include our metal swing plate gear - you'll only find this at PrinterTechs. This model comes standard with a network connector (RJ45) and one 500-sheet tray. Upgrade options include a duplexer and/or extra trays. 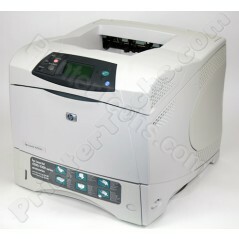 Other models in this series include HP LaserJet 4250 , HP LaserJet 4250TN , HP LaserJet 4250DTN. HP part number Q5401A . Built to last, the 4250N is a great workgroup printer. It is fast (45 pages per minute) and features 48 MB RAM, an RJ45 connector for connecting to a network, and one 500-sheet tray. Just one reason why our printers outlast the competition! The swing plate assembly has been the Achilles’ heel of the 4250 series printers. The plastic gear just isn't durable enough. But PrinterTechs has solved the problem! We install our custom brass swing plate gear and bearing assembly into every one of our LaserJet 4250 series printers. HP's plastic gear design is flawed and prone to wear. We’ve seen the plastic gears worn to the point of failure in as little as 110,000 pages. That’s half of one maintenance cycle -- not good! With our metal gear assembly, the 4250N turns into a durable workhorse. We build the best printers in the industry, and innovations like this demonstrate our industry knowledge, attention to detail, and commitment to quality. Read more about the swing plate problem and PrinterTechs' metal gear solution here. 16.5" x 17.8" x 14.4"